The wing to take pilots from their first flights to competitions. The Luna’s reflex profile creates a simple balance of speed and performance making it perfect for exploring the world. The Luna is a paramotor wing with Cord Cut Billow (CCB) along the leading edge. CCB helps keep the Luna’s reflex profile perfect making the wing really stable at all speeds. With the Luna we focused on the wing’s easy inflation, fun manoeuvrability, stability, and top speed. We believe we have found a great combination for paramotoring. We wanted to make a wing that would be easy to launch and have a short take off distance but also fast and stable for cruising. We succeeded; It is just an easy wing under power. The idea. At NOVA we asked ourselves what a low-end EN B would look like if it was constructed without being restricted by technical complexity. The result is the PHANTOM. Experience progress. The PHANTOM is a new, completely revolutionary paraglider – with a similar aspect-ratio to the ION and with 99 cells, it combines the safety of the ION series with high-level performance. Exceptional directional stability as well as unique precision and simplicity underpin the excellent handling. Maximum complexity. With 99 cells, 804 needle-eye ribs and 3200 slots in the profiles and diagonal ribs to reduce weight, the PHANTOM could be the most complex and technically elaborate wing ever made. With more than 3000 individual components, it sets a new benchmark in paraglider construction. Pleasure without compromise. The PHANTOM is mainly constructed using 27 gram sail cloth. Combined with the weight-optimised inner construction, the size S wing weighs less than 5 kg. Little weight and low aspect ratio result in maximum safety. Never before has so much performance been so easy to fly. Perfectly balanced with unmistakeable looks. The new EPSILON 8 conveys a distinctive feel-good factor and glows with an ideal mix of precision, performance and safety. Unique quality and an innovative inner life transform this ADVANCE classic into a robust lightweight. Enjoy the spellbinding experience of flying the EPSILON 8 – true friendship awaits. Relax and enjoy the thermals The EPSILON 8 demonstrates a very successful combination of pitch and turn behaviour. Steering demands are answered directly and precisely. The EPSILON 8’s compact and stable canopy invites plenty of confidence from the beginning. Even in challenging conditions pilots feel calm and content, able to enjoy the thermals in a relaxed frame of mind. Comfortable Long life thanks to a unique high quality light structure. Not just very light, but downright robust as well: the EPSILON 8 gets attention with its unique choice of materials. Upper and lower surfaces are made of the normal strong European Porcher cloth. Inside the wing the latest technology from the OMEGA XALPS comes into play. Thus the EPSILON 8 weighs almost as little as a light wing, and even so has a long lifespan. The Epsilon 8 has its EN/LTF certification in all sizes. Production in the ADVANCE factory in Vietnam is running at full speed. ADVANCE launches the new IOTA 2, a High-Level EN B glider for ambitious cross-country pilots. Featuring an optimized, low-weight design, the XC-Intermediate IOTA represents the most accommodating balance between performance and piloting ease within the entire ADVANCE product range. The high performance capabilities of the IOTA open the door to the world of long cross-country flights. computational analysis of the interior of the glider resulted in a massive reduction of the overall weight. The topology of the lightening holes of the profiles and diagonal ribs was optimized with respect to the operational stresses and forces. The complex structure is initially reminiscient of a block of Swiss cheese. The outcome of this intensive development process is a product which is noticeably lighter and yet still durable, with an unvarying flight behaviour over time. The unique combination of the ADVANCE semi-circular inlets and Air Scoop Technology enables a significantly lower brake position at stall and considerably larger progressivity in brake pressure, yielding a lower spin tendency when turning. The inner pressure remains high even at high angles of attack thanks to the careful design of the air inlets. The overall goal of this optimization of the inner pressure is the improvement of passive safety. The IOTA comes 100% equipped with low stretch, unsheathed Aramid lines manufactured by Edelrid. There are no Dyneema lines used at all. Durability and robustness have been maximized thanks to the careful assembly of inner and outer loop reinforcements as well as an elaborate yarn coating. Many years of experience using this top-quality product are evidence that the advantages of using unsheathed Edelrid lines dominate over all alternatives. Keeping a close eye on the forces and strains in the canopy is crucial for having the least amount of wrinkles and the best performance. Our design tools and methods are capable of computing the distribution of forces and strains in the entire canopy. The optimal aeroelastic design, from 3D panel shaping through to ballooning, is achieved in an iterative, computational process. This enables the maximum conversion of theoretical performance into real performance. The Iota has its EN/LTF certification in all sizes. Production in the ADVANCE factory in Vietnam is running at full speed. More technology, more know-how, more performance: The MENTOR 4 is the next milestone in the XC intermediate class. As well as revolutionary performance, the MENTOR 4 also offers refined handling in thermals, balanced roll damping and even better climb characteristics. And thanks to its compact sail, the wing has gained efficiency and is also faster. The next milestone. The MENTOR 1, 2 and 3 was outstanding in its class. The Mentor 4 is the continuation of our mission to make the best wing in its class. In comparison to its predecessor, its performance is better by half a glide point. The Mentor 4 offers everything an ambitious cross-country pilot desires: impressive performance combined with a high degree of passive safety. Numerous competition title wins and records are proof of the success of the Mentor design. Optimised in every way. The MENTOR 4 was designed in co-operation with the cross-country pilots in the NOVA Pilots Team. The experience of cross-country hounds fed the development. Our designers and test pilots converted the input, and their own experience, into solutions. The results are improved roll dampening - particularly in accelerated flight - even more precise handling and a further improvement in the climb rate. The higher speed of the MENTOR 4 improves its efficiency against headwind. The MENTOR 4 is a paraglider with impressive performance which has - in the hands of an experienced pilot - a very manageable handling and extreme flight behaviour. Flying the MENTOR 4 does require a degree of skill. Although certified as EN B, the MENTOR 4 is not suitable for beginners and occasional pilots. For queries about the suitability of the wing for you, we will be happy to assist! THEMA 3 - Performance Intermediate another step forward! The brandnew THEMA 3, successor of the THEMA 2 which was a favorable choice all over, stands out with newly refined features. Retaining renown in-flight stability, best launch behavior and uncritical behavior in borderline situations, the new THEMA 3 giving the pilot an even higher trim speed with a resulting improved glide performance. The brake pressure is in comparison to the former model considerably lighter and the handling is just briliant! The higher wing aspect ratio giving a more elegant look as well as an improvement in performance whilst keeping safety and in-flight stability the same. Flat turns in the thermal with best climb rate combined with the outstanding glide makes the new THEMA 3 to a great performing Intermediate second to none! PRO-DESIGN guarantees our well-known top quality workmanship and the use of only the highest quality materials! How can a few lines and some cloth be put together in a way that will fly us hundreds miles? For years we have been trying to build the perfect combination of these materials in an effort to fly further. Every year records are broken so we are definitely doing something right. We have gone through a lot of line and cloth to find our perfect combination in the BASE. 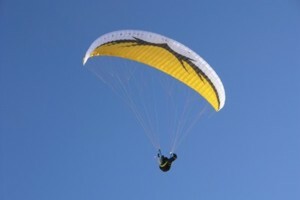 Bruce put his ‘all’ into this high performing EN/LTF-B rated paraglider. The BASE carefully treads that thin line of maximum safety and impressive performance. Bruce Goldsmith Handling, a unique nose design and Cord Cut Billow all make the BASE into a great package of stability and performance. ACCURA 3 - PRO-DESIGN beats the top among the Intermediates! To make improvements on something what is already top is not an easy task! In to many cases designers launch the new version of a good model by making the successor worse. The ACCURA 3 however was modified in the details what can makes things better only whilst keeping best features as they are. Not only pilots who change brand and deciding for a PRO-DESIGN, but also owners of the previous ACCURA 2 and 2.1 will notice the difference and will love the new improvements. Mostly news come along with compromises, that is not the case with the new ACCURA 3. Still the bomb stable canopy in turbulent conditions, still the one with agile and most likable handling, still the one outperforming most higher performance class gliders in thermals. But now in addition with new features making the real good real better! ACCURA 3 – stunning performance packed in easiness and unique in-flight stability, will please infrequently flying pilots same way as experienced pilots flying regularly and since decades! PRO-DESIGN guarantees our well-known top quality workmanship and the use of only the highest quality material! Primarily the target-group of the Garuda are pilots, who are looking for an agile allround-glider, which is suitable for XC-flights as well as for free-style-flying. The Geo 4 is without question the most versatile and comfortable lightweight wing that we have ever built, and is ideal for a vast range of pilots seeking an all-around light wing with excellent comfort and ease of use in the Light-Intermediate class. Our mission with the Geo4 was to retain the balance of comfort and agility and performance that has made the Z4 one of our all-time favourites, but reduce the weight and packing volume to make it an ideal wing for travel, long hikes, or even Vol-Biv and XC adventures. Ozone’s research into light-wing construction began back in 2001 with the introduction of the Peak. Development continued with Ozone wings appearing in every X-Alps race since the first in 2003, and several vol-biv distance records set by Ozone Team pilots in the Himalayas. The Geo 4 incorporates all of the know-how and experience gained during the last 13 years of lightweight R&D. The AirCross U fly 2 provides security and performance. It is the perfect glider for the pilot who demands a huge amount of passive safety, but still need to have enough performance reserves to go on XC. Another feature is the completely reworked nose profile. Here a new profile was used to make the U fly 2 even more efficient and to achieve a better glide. Now the leading edge is stabilized by rods that sustain the profile perfectly and at the same time help to save weight. Perfectly positioned crossports ensure the lateral ventilation of the individual chambers and accelerate the re-inflation of the glider after a one-sided deflation. The newly developed profile helps the U fly 2 to an even higher stability against turbulence over the entire speed range.